Together we are 150. The world’s oldest film festival and Hollywood’s first international awards association celebrated their 75th anniversaries with a party and a joint announcement about the HFPA’s new Residency initiative, in partnership with Film Independent, which will bring three winners from the festival’s Orizzonti section (and three from TIFF) to Los Angeles next January for an intensive three-week mentorship program of lectures and one-on-one labs aimed at honing their skills. 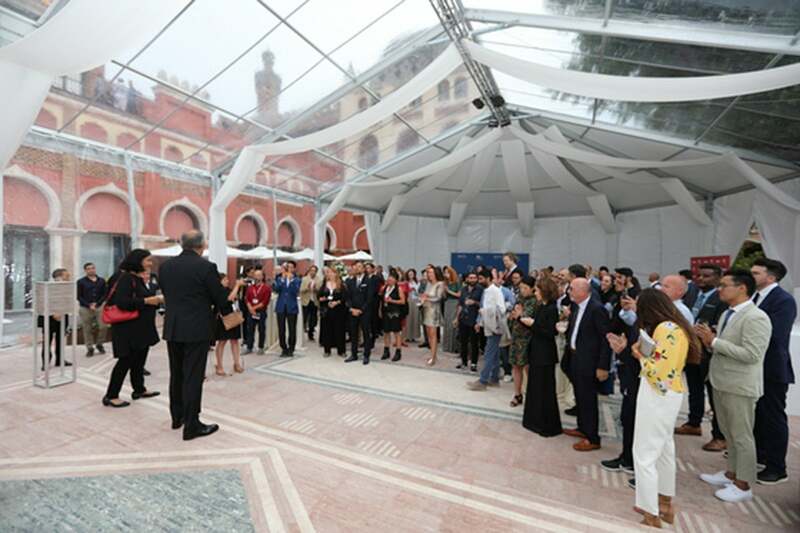 The beautiful see-through tent near the swimming pool of the Hotel Excelsior withstood the thunderstorms while guests sipped bellinis and mixed drinks and mingled with Hollywood stars and international filmmakers. Bradley Cooper and entourage arrived before his premiere of A Star Is Born. His lead actress could not make it, unfortunately. To move Lady Gaga from place to place during the festival presented a challenge for the studio and the organizers: she was hounded by six to eight paparazzi boats at all times, not to mention hordes of fans trying to catch a glimpse, an autograph or a selfie. And her pale pink feathery dress by Valentino Couture would not have survived until she had to go on the red carpet that night: “I would have looked like a wet big bird!” she told us later, laughing. Golden Globe winner Florian Henckel von Donnersmarck, the tall German who burst into Hollywood in 2006 with his film The Lives Of Others came with wife Christiane. He is in Venice with his new project Werk Ohne Autor (Never Look Away) about a German painter tormented by his past. He also brought one of his lead actors, Sebastian Koch, to the event. Italy’s hottest director of the past year, Luca Guadagnino, a Golden Globe nominee with I Am Love and Call Me By Your Name, is in Venice to show Suspiria, a two-and-a-half hour remake of the Dario Argento film from the 70s. He waited for his leading ladies who never turned up: Tilda Swinton, Chloë Grace Moretz and Dakota Johnson were up in the air – circling the lagoon on the airplane who did not get permission to land due to the thunderstorms and did not arrive until much later. Guadagnino ended up chitchatting with Naomi Watts about the weather, life and anything but his film, because Watts is not here as an actress but to judge the main competition. And that includes Suspiria among the 21 films vying for the Golden Lion come next Saturday. Naomi, in a beautiful Valentino gown, told us: “I have seen seven films so far and am rushing from screening to screening, from premiere to premiere and jury meetings in between.” Needless to say, and despite the packed schedule, she manages to look gorgeous wherever she goes. The party ended just before another rainstorm drenched the Lido and festival goers escaped into screenings or the tiny bars and restaurants that line the Lungomare Marconi and the Via Sandra Gallo.